10, 9, 8, 7 . . . Ignition Sequence Start . . .
"I am proud to say that the team has even more fantastic experiences lined up for attendees at Oracle OpenWorld this year. Near and dear to my heart is our Oracle OpenWorld User Experience Exchange. This will be our fourth annual event, and it just gets better every year for partners, customers, and analysts alike!" If you are an Oracle Fusion Middleware and PaaS Oracle PartnerNetwork member, Oracle SaaS customer, Oracle Technology Network Ace of any species, or a UX thought leader discovering the world of digital transformation, then you cannot afford not to spend an hour at our Exchange. Design and build a SaaS simplified UI in Oracle Jet? No problem. When you sign up for the Exchange. Or perhaps, an Oracle Mobile Application Framework accelerator kit for SaaS UX takes your fancy? 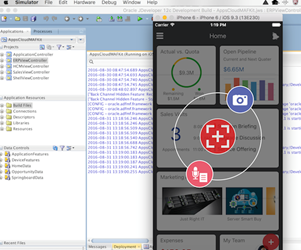 Apply UX design patterns to Oracle MAF in Oracle JDeveloper and use smartphone native features? Find out more at the Exchange. This is an exclusive, hands-on, in-person event that demonstrates the Oracle Applications Cloud UX and our shared enablement on offer, as well as some near-future Oracle UX and technology-based proof of concept ideas that’ll inspire you to explore new business opportunities. NEW PaaS4SaaS TOOLS: The OAUX team has launched a Rapid Development Kit to help partners grow their Oracle Applications Cloud business and offer more value to customers. It’s a work in progress, but the design patterns for Release 10 are already available for download via ebook. See why user-centricity, simplicity, and consistency remain front and center in Cloud user experience designs. Check out the Forbes Oracle Voice interview with Ultan O’Broin, who leads the partner enablement effort for the OAUX team. The Voice of User Experience (VoX) blog has also published a recent post on extensibility in Release 10. UX NEWS ON ORACLE VOICE: OAUX Group Vice President Jeremy Ashley, who leads the OAUX team, tackles new trends in the workforce and, specifically, what the OAUX team is doing in regard to mobility on Forbes.com’s Oracle Voice in Mobile UX: We’re No Longer Slaves To The System. This eBook contains user experience design patterns that Oracle uses to build the sleek, modern simplified user interface for the Oracle Cloud Applications portfolio, such as the Oracle ERP Cloud, Oracle HCM Cloud, and Oracle Sales Cloud. Get the free eBook here. The simplified user interface (UI), designed by the Oracle Applications User Experience team, extends its reach in the recent Oracle Applications Cloud Release 8 with user experience enhancements that include expanded simplicity, expanded visualizations and analytics, and expanded extensibility and customization options – all in the cloud. Check the Voice of User Experience (VoX) blog for a look at some of the simplified UI user experience highlights. New tools to help you tailor your applications. Want to build or tailor your own application? You don’t have to be a developer to use these tools. Check the Usable Apps website for new podcasts, presentations, UX design patterns, and success stories and leverage Oracle’s best practices from our newest releases. Our UX design patterns, in particular, will save you time and money while increasing your users’ productivity. If you’re looking to speed up a customization project in PeopleSoft, go to the UX Direct blog for information about the PeopleSoft 8.53/9.2 prototyping tool kit that was just released. This tool kit provides user interface components in Microsoft PowerPoint format that you can use by simply dragging and dropping into your slides to create user interface designs for your application. Hear about the JD Edwards user experience from Gary Grieshaber, Senior Director, EnterpriseOne Product Strategy, in this video, which showcases today’s user experience highlights in Oracle’s JD Edwards applications. Hear about the Oracle E-Business Suite user experience from Nadia Bendjedou, Senior Director, Oracle E-Business Suite Product Strategy, in this video, which showcases today’s user experience highlights in Oracle’s E-Business Suite applications. With this release the number of viewlets (video’s) has grown from 21 to 37. Each viewlet can be shown individually or in conjunction with any others and can show either technical feature or business centric demo’s. There is a matrix of options for using the demos, to help you select relevant materials there is a ScenarioMatrix.xls spreadsheet, you can filter on any of the columns to reduce to the viewlets that interest you. RightNow – New business scenario’s. RTD – Integrated into several front-ends, Composite Pagelet for RightNow, plus back-end viewlets. WC-Sites – updated with latest MyBank demo with SCV MyProfile. SCVLite VirtualBox VM (due to be uploaded to retriever mid-may). Documentation on Design Pattern and SCV Service. New MDM / EDQ scenario viewlet. 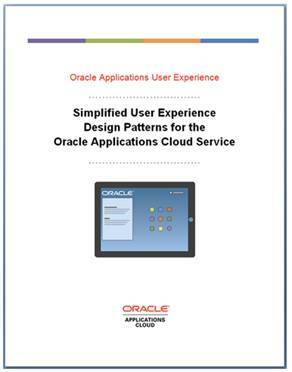 The Simplified User Experience Design Patterns for the Oracle Applications Cloud Service eBook has been published recently. The free eBook provides the user experience design patterns that Oracle uses to build simplified user interfaces (UIs). Read more about it on the Usable Apps blog, or download it directly at tinyurl.com/SimplifiedUI. You’ll also find a new article on the Usable Apps website about extensibility in the simplified UI: "Making the Complex Simple: Extensibility and Customization in the Oracle Applications Cloud." Read and learn more about how easy extensibility aligns with the overall Oracle Applications Cloud’s user experience strategy of simplification. ABOUT RELEASE 8: Take a look at these recent blog posts to find out what analysts and others are saying about the usability they see in Release 8. Early Reports Say the Oracle Sales Cloud May Finally Have Come of Age,” analyst J. Bruce Daley calls out usability specifically. Case study: BG Group turns to cloud HR to reach staff in multiple countries,” author Bill Goodwin of ComputerWeekly.com says the Oracle HCM Cloud “has proved to be easier and more intuitive for HR staff to use than the previous SAP-based technology” for Oracle customer BG Group, a natural gas exploration and production company. Oracle Platinum Partner AMIS Services BV, a friend of the Oracle Applications User Experience (UX) team, has been awarded the Oracle SOA Community Award and the SOA Partner Community Award 2014. Visit the SOA Community Blog for a post on “Fusion Middleware Partner Community Awards 2014” to read more. Amis played host to the OAUX Expo in March, and posts about the Oracle Applications UX themes of simplicity, mobility, and extensibility continue. Dutch developer Richard Olrichs, who attended the expo, wrote “What I learned from the UX Event.” Tech author Chris Koenis also wrote a post in Dutch after the expo called “World travelers hunt futuristic interface.” A translated version is available. “PeopleSoft Talk with Marc Weintraub: PeopleSoft Fluid User Interface featuring Willie Suh”: In this PeopleSoft Talk, PeopleSoft Senior Director Marc Weintraub talks with Willie Suh, Vice President of PeopleTools Development, about the PeopleSoft Fluid User Interface. Oracle ACE Director Basheer Khan shares his thoughts on Oracle’s Cloud strategy in the April 2014 edition of Profit Magazine. The interview, “Clouds in Vegas,” focuses on Khan’s session at Collaborate 2014 and how he thinks organizations can benefit from moving to the cloud. Achieving Superior Digital Experience with Oracle AppAdvantage Find out how Oracle AppAdvantage and Oracle Fusion Middleware solutions, such as those for web experience management, web content management, and self-service portals, can help you create a superior digital customer experience. Read More. 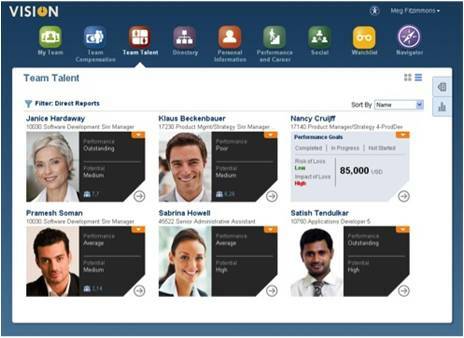 Visit the Voice of User Experience, or VoX, blog for a new post about the strategy behind Oracle’s Human Capital Management (HCM) simplified UI. Learn what’s new from the Oracle Applications User Experience team in Release 7, and find links to new video demos on simplified UI for self-service users and managers. 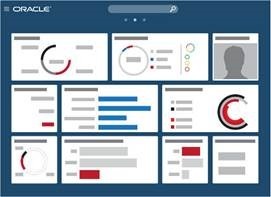 There are also a few new posts about Oracle Sales Cloud, such as a post on the Oracle Applications Blog called “Wow Sales Managers and Reps with An Unmatched User Experience.” A separate post published on VoX last month about Oracle Sales Cloud focuses on what’s new with simplified UI in Release 7. Oracle invests a great deal in creating a user experience for its applications that empowers customers to be more productive and efficient. One way that investment is made is by exploring new technologies and looking for ways to use them so that the Oracle user experience continues to evolve. Much of that research takes place among the ranks of the Oracle Applications User Experience (UX) team. Recent posts on the Usable Apps blog and on TheAppsLab blog look at what and how members of the Applications UX team are exploring new concepts. We invite you to join the conversation! Tell us about your experiences with new technology, and how you think they could be used. To read more about what we’ve found, head over to the Usable Apps blog for new posts on Voice, social network integration, and Google Glass. Then check out Jake Kuramoto’s new post about exploring new concepts on TheAppsLab blog. Visit the Voice of User Experience, or VoX, blog for a new post from Misha Vaughan, an Oracle Applications User Experience director, to see what she writes about “Six Things You Can Do Today to Jump-Start Your User Experience for Enterprise Applications.” Her post tells you how to build in good usability practices, even on a small budget.